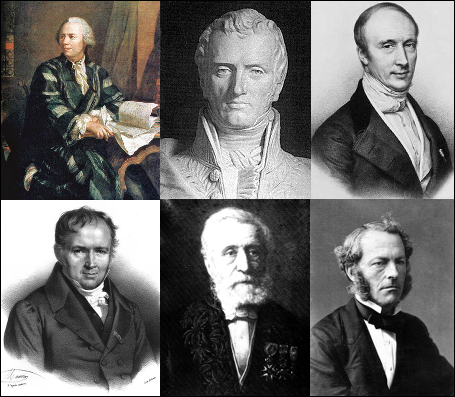 The International Equation Naming Organization (IENO) has renamed the Navier-Stokes equations to the Euler-Navier-Cauchy-Poisson-Saint-Venant-Stokes equations or ENComPaSS for short. You will no doubt recall that the ENComPaSS equations are the foundation on which much of modern day fluid dynamics is based, including Computational Fluid Dynamics (CFD), so this is indeed a momentous event. You know how it is - you are away from the office and you are desperate to check in on a series of Computational Fluid Dynamics (CFD) simulations you are running back at your base. Then once the simulations finish you'd like to take a moment to look at each one with all the benefits of hardware accelerated graphics on your laptop, while still enjoying your latte at Starbucks. Well you can do both today without any extra outlay using Caedium and free apps from Google - let me describe how. 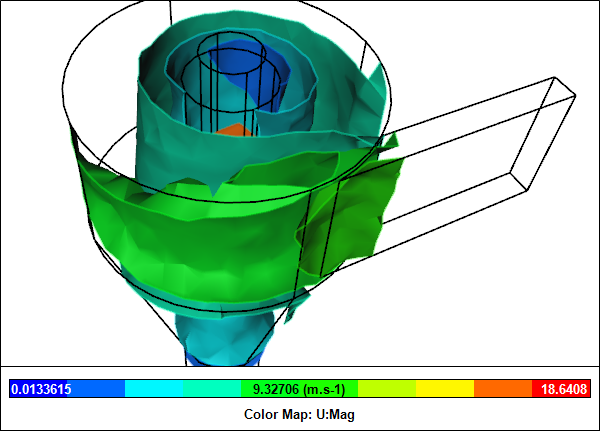 After using Computational Fluid Dynamics (CFD) to simulate the blower and cyclone in Matthias Wandel's "Small Dust Collector" we next turn our attention to the last remaining major component - the twin filter assembly. The filters remove fine particles that escape the cyclone, leaving the air to pass through the blower and exit to the atmosphere. 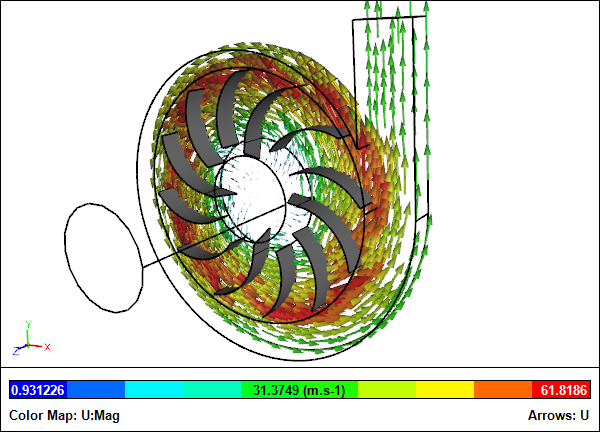 Hot on the heels of my recent Computational Fluid Dynamics (CFD) analysis of the blower for Matthias Wandel's "Small Dust Collector" comes a new CFD study of his cyclone. Cyclones are used in many industries to separate fluids from particles. In Matthias' case he wanted to separate sawdust and wood shavings from air collected from the working area of various woodworking machines. I recently came across an interesting fluid dynamics project modestly titled "Small Dust Collector" by Matthias Wandel of Woodgears. The unusual twist - at least from my metal-orientated view of the world - was the use of wood as the primary construction material. 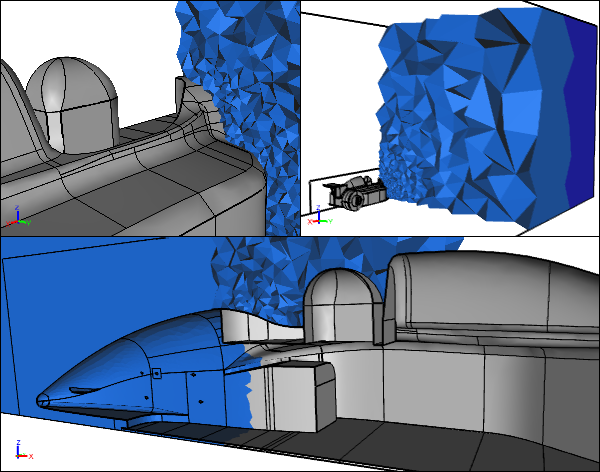 The project includes the construction of a blower, cyclone, filter housing, and filter manifold - all prime candidates for Computational Fluid Dynamics (CFD) simulations. I sense a series of blog posts, so first let's take a look at the blower also known as a centrifugal fan or squirrel cage fan. Where the action of a fluid is the primary concern in the design of a device, e.g., a cyclone, sometimes it can seem that fluid is going out of its way to be difficult - a lot like trying to herd cats. 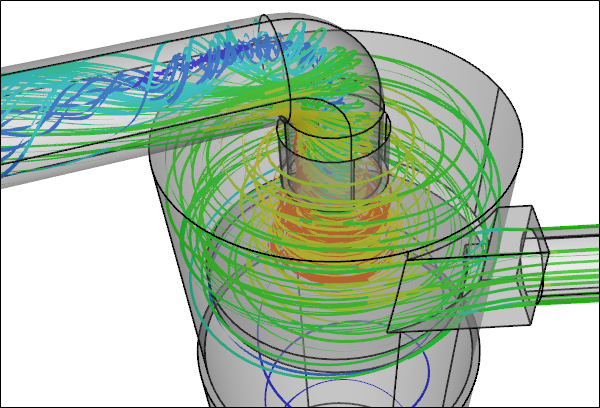 Fluid device designers have to carefully match geometry to flow rates to meet performance criteria. However, if they were to rely solely on physical testing, then their task is that much harder and more costly because they can't easily visualize the flow behavior. 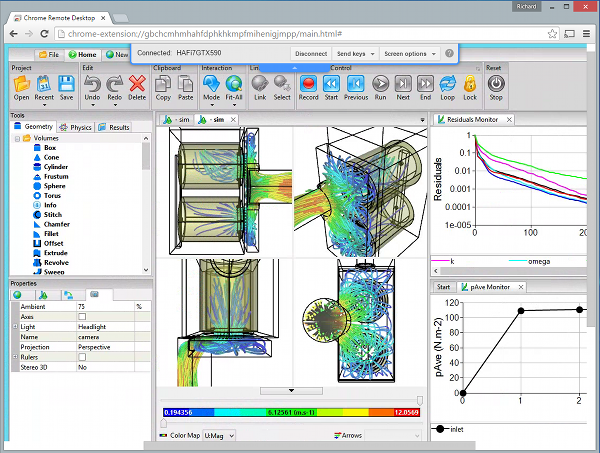 Let Computational Fluid Dynamics (CFD) save you money and time as a supplement to physical testing. Reduced complexity 3D model for Computational Fluid Dynamics (CFD) is a great way to avoid getting bogged down in details that are not relevant for a simulation. 3D video games and 3D animation applications have been using reduced complexity 3D models combined with texture maps to present rich visuals since the dawn of the digital age. 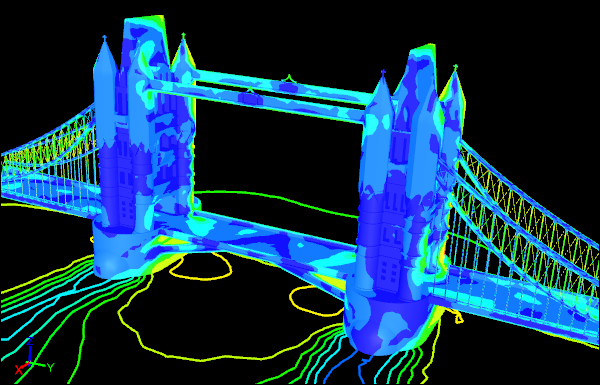 These models and the concepts to build them can be extremely useful for CFD. 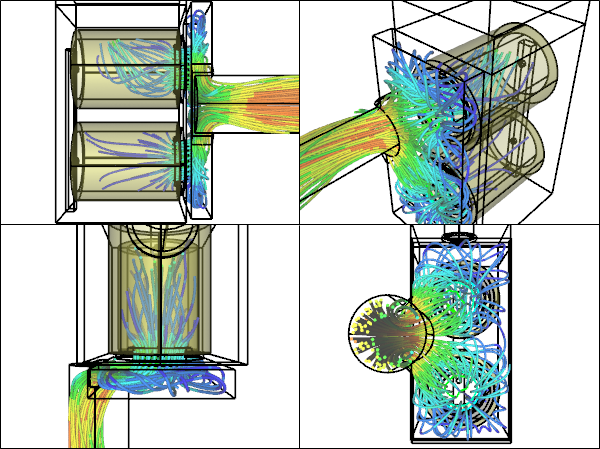 A fresh new year is a great excuse to share with you the Computational Fluid Dynamics (CFD) simulations collection that starred in various 2014 blog posts. They are all here, from Tower Bridge to airships. 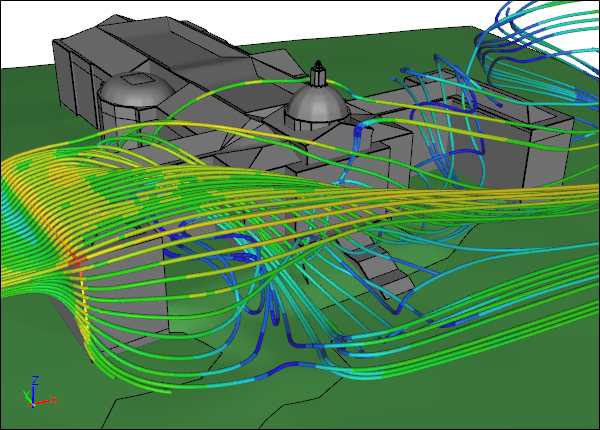 2015 is here, but before we leave last year in the dust let's take a moment to review the 2014 blog posts that can make this year your best yet in Computational Fluid Dynamics (CFD). External CFD Flow VolumeSubstance (air) modeled outside the car. Half model due to symmetry. It's not just Google that can doodle. The Computational Fluid Dynamics (CFD) community on occasion has also been known to embrace its whimsy side, especially during holidays, and so I give you a CFD doodle. For fluid dynamicists (or at least this one) the snow globe has always had a special attraction and if one is good then four has to be awesome, right?